Home » Coiffures, Hats. The Luxurious Assyrian Costumes. 1. Modest coiffure draped behind, of broad-checked material. 2. Woman’s hair confined in a narrow band, the two fringed ends of which hang low down on one side. On the forehead, an embroidered and beaded motif adorns the band. 3. Small Chaldean hat, with the crown covered by the tucked-up brim. This coiffure is adorned all over with simila motifs in the shapes of discs. 4. Woman’s embroidered coiffure, tightly covering the top of the head and falling on one side like a veil. 5. 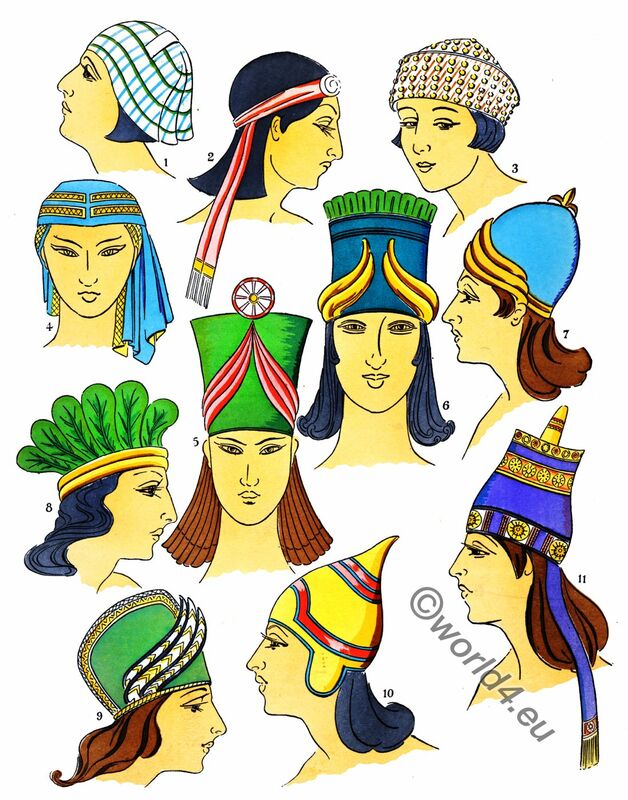 High” hat-crown” worn by the Assyrians, with symmetrical trimming and cockade set in the centre, on the top of the hat. 6. Hat-shaped coiffure with scrolled trimming about the base and wreath of foliage in the upper part. 7. Assyrian King’s coiffure in the shape of a helmet, with gold flower; also worn by his spouse. 8. Wreath of leaves fixed by a double band round the head. 9. Cap with original helmet, trimmed in Assyrian fashion. 10. Pointed cap of stuff embroidered with galloons in several colours. Two side lappets are tucked down to protect the ears. 11. Royal tiara adorned with rosaces and geometrical lines. Two fringed flaps descend on the sides. Source: Paul Louis de Giafferri. The History of the Feminine Costume of the World. The Luxurious Assyrian Costumes. Published: 1926. Read more: Assyrian, Babylonian costume history. Mesopotamia.